PHOENIX, AZ – May 18, 2017 – GlobalTranz Enterprises, Inc., a leading technology-driven freight management solution provider, today announced it has won the Association for Corporate Growth (ACG) Arizona Deal of the Year Award for its acquisition of Global Freight Source, Inc. The award was presented at the ACG Deal of the Year Award Dinner on May 16, 2017. 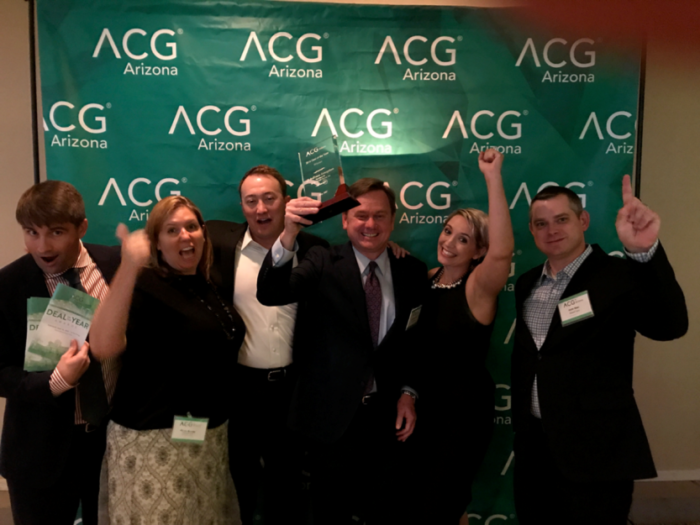 The “Deal of the Year” is an award given by the Arizona Chapter of the ACG to recognize a company or private equity firm for its accomplishments regarding a merger, acquisition or capital market transaction. The acquisition of Global Freight Source (GFS), a leading freight brokerage and logistics company, was a strategic move that helped GlobalTranz further solidify its position as a top freight brokerage firm. Partners who were instrumental in helping GlobalTranz in this deal include: law firm Quarles & Brady LLP, Wells Fargo bank and accounting firm RSM US LLP. On the same day that GlobalTranz was recognized with the ACG Deal of the Year Award for its acquisition of GFS, the company announced its latest move – the acquisition of Logistics Planning Services (LPS), a leading managed transportation provider and freight brokerage company. The LPS addition will further accelerate GlobalTranz’ growth and significantly increase its market share in third-party logistics (3PL) services.